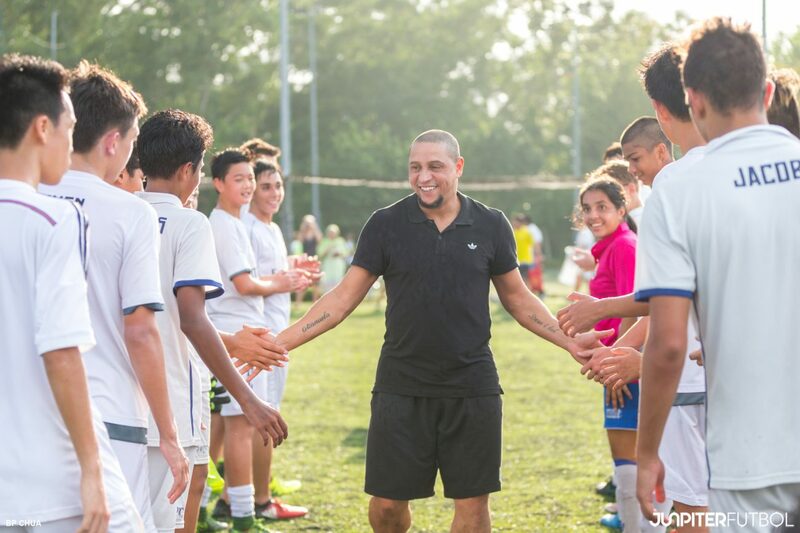 Former Real Madrid & Brazil International’s legend, Roberto Carlos paid a short visit to Singapore yesterday. 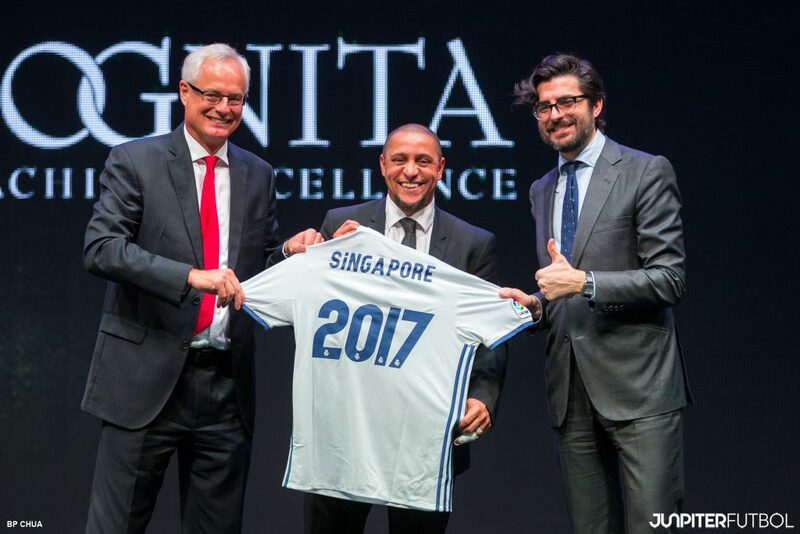 Decked out in a black suit, the 43-year-old Real Madrid’s Ambassador visited Institute of Technical Education (ITE) College Central and Stamford American International School to share his football stories with all students. Despite having an extremely tight schedule, the former World Cup winner did not disappoint any of his football fans, as he obliged to all photo-taking and autograph requests. The friendly defender also delighted many of the Real Madrid’s fans by participating in the football training sessions conducted in the International School. 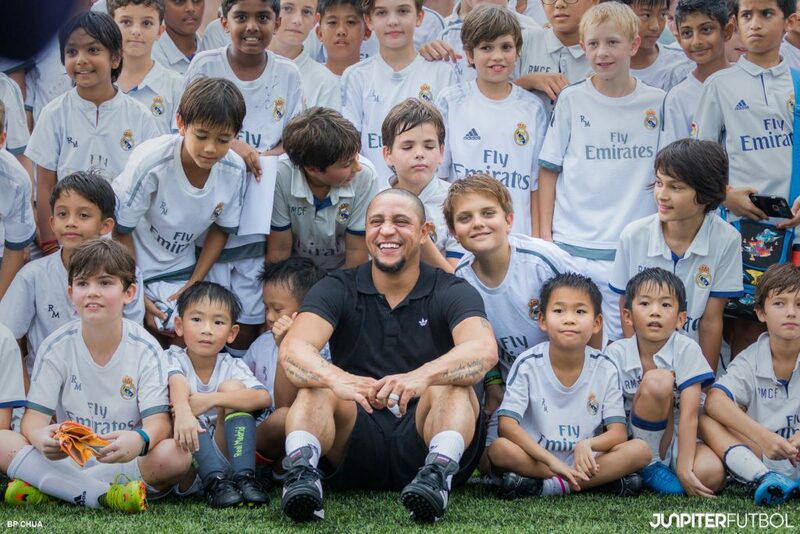 Right after a quick refresh & lunch at the most talked-about Café, Café Football at The Arena, Roberto Carlos made his way to the Real Madrid Foundation Football School’s exclusive training session which was held at the Rain Forest Sports Hub. Hundreds of School’s students and their family members who have been waiting anxiously for the Legend’s arrival erupted the moment he arrived at the venue. Roberto Carlos wasted no time and immediately showed off his ball controlling and free kick skills much to the delights of all the people at the training pitches. “Actually, I am feeling the fatigue due to jetlag but the moment I saw the smiles from all the children here, I felt motivated and energized to continue, “ said Carlos via translator. “I really hope that my visit to Singapore can inspire more children to come and join Real Madrid Foundation Technical Academy. We have a very good School here in Singapore where the children can benefit from our teaching. We want to teach the children all the good values which can be used not just on the pitch but off the pitch as well,” added Roberto Carlos. To know more about Real Madrid Foundation Technical Academy, Click Here.